In the right hand column of this blog below the book ads there is a spot updated in realtime showing Guido’s portfolio position. For the readers who are interested (there are a few) this is the portfolio report for the second half of this year (first half here). The huge pink drop on the chart is when Guido decided that the U.S. stock-market was getting carried away to the upside and shorted U.S. Dow futures. He was at the time sat in a deckchair in France drinking rosé in the August sun. When over the next few days the trade started to go wrong, and the Dow pushed well past 9000, Guido drank more rosé and doubled up his short. Who said rosé was cheap? By th e time Guido sobered up and exited the trade it had wiped out all the profits from the first half of the year (and some) putting the portfolio in the red. So Guido stuck to jobbing the gilt market from the short side and dodging the QE bidding, then figured out that it was possible to join the QE bidding. Next trade mess-up was trying in November, despite being a huge gold bull, shorting a technically over-bought gold market. Except it wasn’t really over-bought fundamentally as India’s central bank had bought 200 tonnes. Net-net the year’s trading of gold didn’t really make any money as a result. Made small profits jobbing oil and getting long the euro. The portfolio was mostly flat with no positions or risk during the year (68 trades were made all year, mostly held for less than a week). Guido was too busy doing other things and has removed the trading software from his Blackberry to prevent himself from trading financial markets under the influence. Nevertheless the portfolio is up 40.82% on the year versus a stock-market up about 23%. The portfolio’s high leverage and sharp moves in Net Asset Value* are due to having a target of making a 100% annualised return. Guido was 78% up at one point in early November before giving back profits. Next year Guido can see no reason to hold gilts, if the markets sense a close election it will spook the gilt market and there is going to be a continuing flood of supply no matter what. The exit from QE will probably be horrendous. 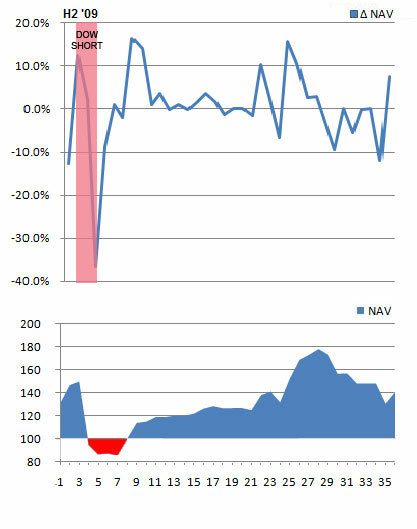 *Eagle eyed readers might spot a discrepancy in the NAV figures, the final figure is based on NAV versus the start of the year and the NAV changes throughout the year are based on trade by trade changes.